The exterior of our payload is made out of an cardboard box. Inside, the devices are protected using small boxes we have created using recyclable styrofoam. The electronics are prevalent, distributing the weight, making it easy for the box to fall on its base. The total weight was less than the maximum limit, weighing 1.675 pounds. Our design survived the 8 foot drop, landing perfectly on its base, and the contents inside were safe. 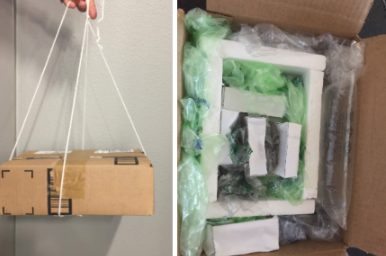 Styrofoam and bubble wrap helped the contents inside stay protected.